Call us today, and let our staff help you select the right cover for you! Merlin covers work hard, are stronger and look better longer. Manufactured completely with US-made materials and components that exceed industry standards, our covers feature unsurpassed thread and webbing strength, brass anchors and powerful stainless steel tension springs. Each showcases the latest technology to protect your pool against the relentless forces of nature, as well as the unpredictable nature of children and pets. Other covers simply pale by comparison! Factory Direct Liners is an authorized Merlin Industries dealer. Want to get swimming sooner? Our patented SmartMesh cover features a high tech weave that allows water to pass through while blocking sunlight and filtering debris to 40 microns! Without sunlight, algae is less likely to grow, so you’ll open your pool to cleaner water in the spring, maintain your pool with greater ease, spend less on chemicals and extend its life. It’s the cutting edge in cover technology – the best choice you can make for your pool! SmartMesh offers the highest abrasion resistance, tear strength, burst strength and sunlight shading around. SmartMesh is also approximately 40% lighter than a solid safety cover, making it much easier to put on and take off! We back SmartMesh with a 15 year limited warranty. Available in Green, Blue, Grey and Tan. Dura-Mesh offers the industry’s best combination of abrasion resistance, tear strength, burst strength and sunlight shading of any standard mesh cover. It is 68% stronger than other standard mesh, and provides 95% shade. We back Dura-Mesh with a 15 year limited warranty. Available in Green, Blue, Black, Tan and Grey. Our ‘tension secure” solid safety cover offers security plus a complete barrier to water, dirt, dust and sunlight. Additional features include an automatic pump or patented window mesh filter panel to remove standing water. Backed by a 10 year limited warranty. Solid covers are available up to approximately 2000 square feet. Loop-Loc’s Computer Aided Design ensures a perfect, custom fit for any shape or size pool: from a simple square to the most complex installation, Loop-Loc can manufacture a custom cover with the perfect fit for any pool or spa. Loop-Loc puts an unbreakable ‘lock’ on your pool to protect your family. Only Loop-Loc is available with the patented Cable-Lock and Gapguard child safety intrusion barriers. They close the dangerous gaps created where raised obstructions meet the cover’s edge, so there’s no way a child or pet can slip through. Loop-Loc covers always stay tight, clean and beautiful on your pool, and its super dense mesh allows rain to drain through. The cover stays dry and beautiful in any weather! Plus, it’s easy to install and remove with its unique anchoring system. Available in Green, Tan, Black, Blue or Grey. UV stabilized tarp-type covers are lighter and tougher to withstand winter conditions. Fabric will not crack, split or tear. Warranties range from 8 to 20 years. Available for in-ground and above ground pools. All covers have grommets. Above ground covers come with winch and PVC coated steel cable. Custom sizes made to order. We can also custom-make a tarp cover in many fabrics to accommodate your shape pool and with sections for steps. Made in America with American-made vinyl material. Stock sizes in green only. Custom sizes available in green and blue. 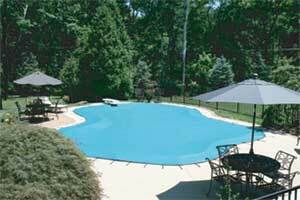 Safety pool covers provide years of worry-free use and make maintenance simple. Custom designed to fit any pool, safety pool covers can make your pool attractive, keeping dirt, debris and small animals out of your pool during the off season. 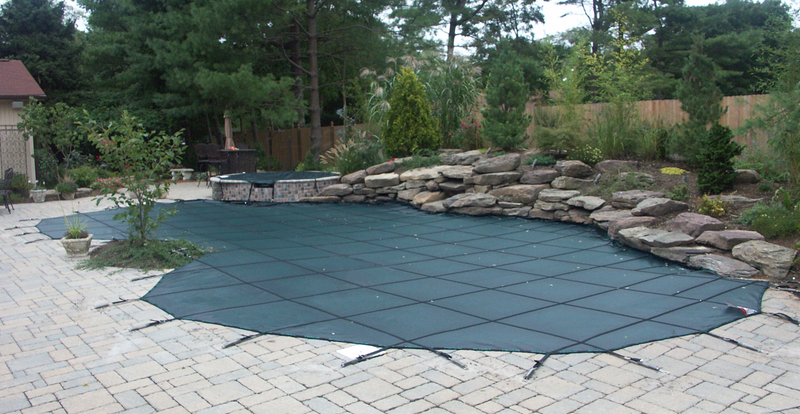 Safety pool covers secure your pool from children and pets who may wander across the top. They are secured by brass concrete anchors and stainless steel springs, and woven with heavy-duty straps to create a form-fitting safety cover that can support even the heaviest load. Safety covers are available in mesh or solid in a variety of colors.